My weekend forray to the land of re-born baby dolls was an interesting experience. I must admit that the ultra realistic baby dolls there were not my cup of tea, but there does seem to be a very dedicated group that practices the craft and/or collects the “babies” as they refer to them. My sculptured art dolls were most definitely different from everything else there, and they did receive a very positive response from those walking around the exhibit floor. Yesterday, several of my pieces returned to their usual venue, the Hillsborough Gallery of Arts. They do look much more at home atop their pedestals than all grouped together on a table. With a little visual room the viewer is allowed more time to take in all the details of each figure. I did take the time to do something different with the display of one of the returning dolls. In the gallery we have a room that we use to display member artists’ printed pieces like prints, note cards, books etc. 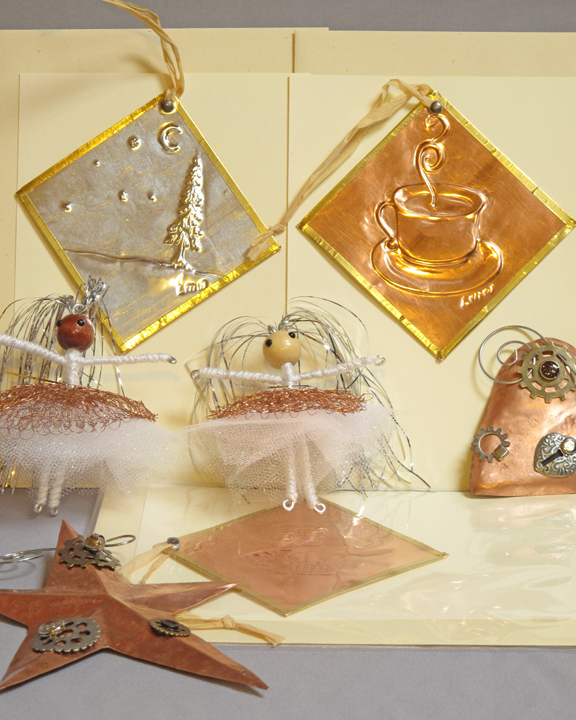 Along the walls of this room, we have acrylic card holders that hold artist bio cards for visitors to help themselves. Above each card bin there is a bit of wall space where each of us can display one or two small works. 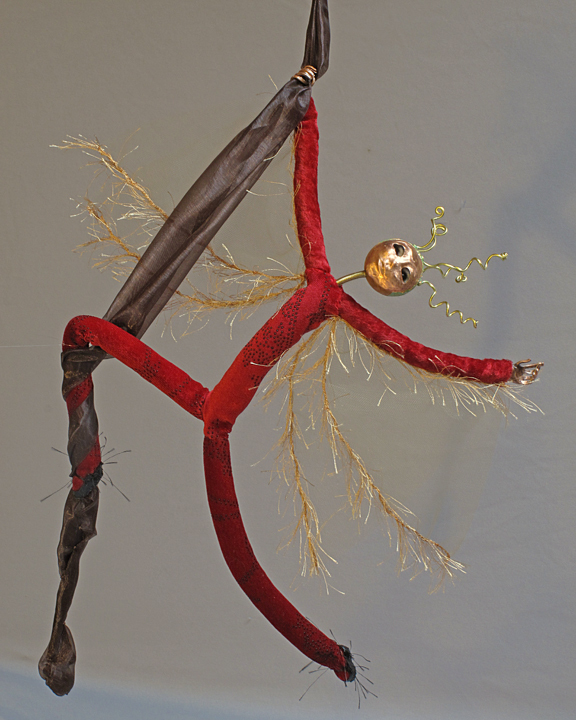 I usually hang a mixed media wall sculpture, but this month I decided to put one of my seated art dolls there. Steam looks pretty comfortable atop her shadow box display, and the interior of the box provides a great space to store the display block she usually perches on, and her information label. Now it is time to get back into the studio and create a few more pieces for my featured artist show that opens at the end of July. I’ll be sure to give you a sneak peek right here. 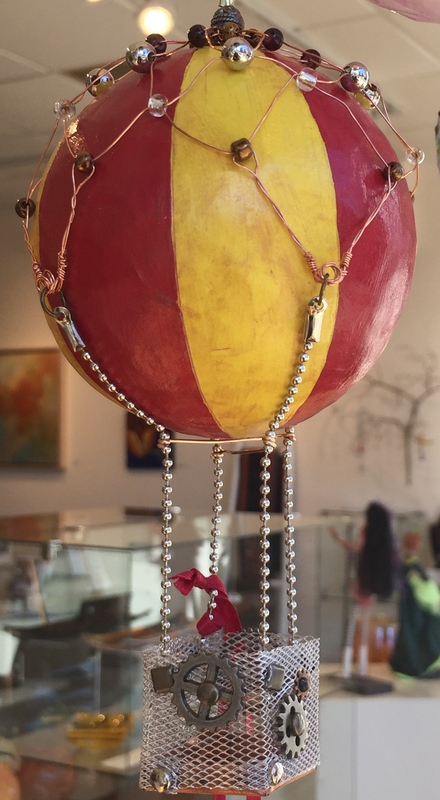 This entry was posted in Art Dolls, Art Shows and tagged art doll, Art doll show, Doll show, figure, figure sculpture, hanging sculpture, Hillsborough Gallery, mixed media, one of a kind, steampunk, the Hillsborough Gallery of Arts on June 24, 2014 by lynnadmin. 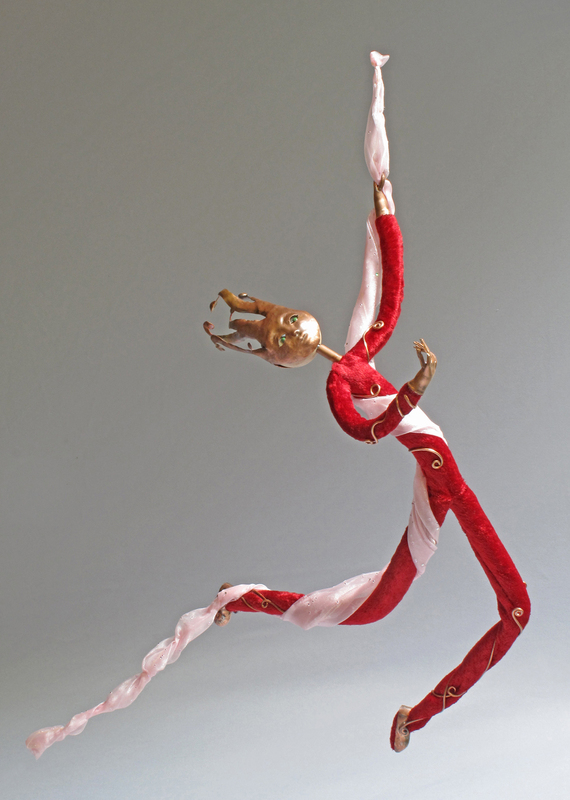 “Cirque II” is my latest art doll figure. Like my original “Cirque” she is a fanciful aerial silks acrobat. 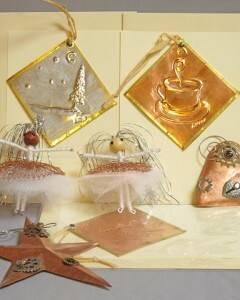 I enjoy occasionally creating dolls like these that hang rather than sit or stand on a base. They allow for movement to enter into the design. 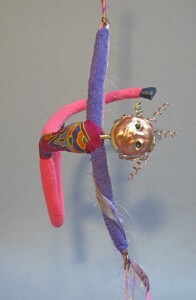 Properly balanced and positioned, a doll like Cirque II can catch the slightest bit of air movement and dance or spin. I like how this adds another dimension of interest to the piece. It also allows for greater flexibility in display. However, it does provide a unique challenge in the area of photography. Obtaining that crisp and clear photograph of a sculpture that is moving, no matter how slowly, can be vexing. Thankfully, the dolls are not very large, or heavy. The addition of a couple more strands of mono-filament at strategic locations to tether her in a fixed position seems to be the answer. Trying to give the illusion that she is still moving while she is not was the goal. This entry was posted in Art Dolls and tagged art doll, cirque, figure, figure sculpture, hanging sculpture, one of a kind on March 18, 2014 by lynnadmin.